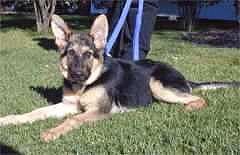 We have a story about a dog that we got from South Bay Purebred Rescue. 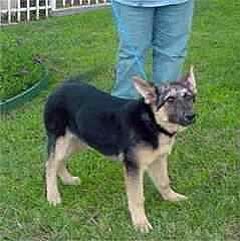 We were looking for a German Shepherd puppy when a friend of ours pointed us to your website back in February 2006. A special needs puppy, named “Shep”, was listed that had a sad and terrible tale to tell. Apparently the German Shepherd puppy was found wandering the city streets with a bloodied head and probably wasn’t older that 4 months. After a vet looked at him, it was determined that the injuries were inconsistent with an auto accident and were more likely someone took a club to his head. His skull was fractured in two places, one a floating skull fracture, and his left cheekbone and upper jaw was also fractured. We were heart-broken and fell in love with his photos on the website. So we rushed to adopt him and take him into our home with our other two rescue dogs and two rescue cats. He was renamed “Rí”, pronounced “Ree”, which in Irish Gaelic means “King”. It’s been now nearly two years that we have had Ri in our home and he turned out to be a really great and clever dog. He’s now about 120 lbs and is a lively and happy big dog. He can clear the coffee table with one mighty sweep of his tail. Though we did go through some grief in the first six month teaching him discipline and getting him socialized to the cats. He was very mouthy, though he was good-hearted if we let him know if he bit too hard. We would yelp and he would immediately start licking our hands as to atone for “hurting” us. This made him to have a very soft mouth now. We are still working on his mouthing and its getting better. 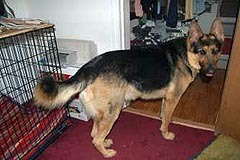 Perhaps his previous owner didn’t understand German Shepherds, his mouthing and instead interpreted this behavior as aggression. Maybe he nipped a child, as one would expect a puppy to do with his playmates, and the parent freaked and decided to beat him in punishment. 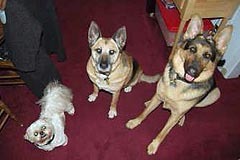 As such we feel the best thing for him is to be constantly socialized with us, his pack mates and our friends. His injuries have healed though he still shows the scars of his brutal beating with a slight asymmetric head and lop-sided mouth. He likes to lick the cats and tries to play with them but they seem not to understand the concept. He seems to look after our oldest female dog, Tasha, an Akita-German Shepherd, as his mother since he’s always licking her face and tries to steal her tennis ball. He’s very clever with his paws and will play with the tennis ball like a cat batting it around or tries to steal tennis balls by placing his paw over the ball and rolling it towards him. 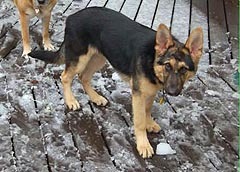 Also he will tease us by taking one of our shoes and making us chase him through the house. Being chased is great fun for him. He also turned out to be a “talker” and tries to communicate with us when he wants something. When he’s hungry, he will point at the dog food bins and turnaround and look at us and whine or grunt a bit and followed by a soft bark. Also he’ll flip over his empty food bowl, bang it on the floor and groan when he’s frustrated that Tasha has a ball and he doesn’t. He loves tennis balls and can play for hours just catching the ball with a flying leap. He’ll follow us everywhere through the house and lets our youngest daughter hug him quite vigorously. As such, he really turned out to be a fine dog.